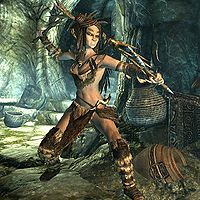 Despite appearing primitive in nature, the Forsworn have proven to be an aggressive political force which has an astute grasp of insurgency warfare, and even have agents living among the populace of Markarth in secret. They directly oppose all other major political groups active in the Reach, including the Thalmor. They wish to drive both Nords and the Empire out of the Reach and attain independence. 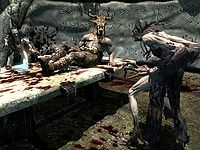 The Forsworn are the most common type of hostile NPC encountered in the Reach. Encounters with them will not occur under normal conditions outside of the Reach. It is not possible to join the Forsworn, but you can side with them through a quest series and one area will become non-hostile. While the Empire and the Aldmeri Dominion fought the Great War, much of the Empire was abandoned by the Imperials. The Reachmen long held that they were the true owners of the Reach and for centuries begrudgingly accepted Nord rule. Seeing the perfect opportunity, they rebelled against the Nords and captured the nearly undefended city of Markarth and all of the Reach. Their control over the hold lasted for two years, from 4E 174 to 4E 176, and was administered relatively peacefully, with only a few of the harshest Nord landowners put to death. In 4E 176 Igmund, the son of the deposed Jarl, promised Ulfric Stormcloak free worship of Talos in exchange for putting down the rebellion and retaking the Reach. Igmund knew this promise was in direct violation of the White-Gold Concordat, but wagered that the Thalmor would not discover it. 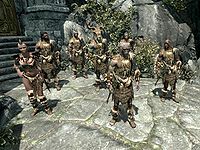 Ulfric led a Nord militia against the Reachmen and used the Thu'um to shout them from the very walls of Markarth and drive them from the city. Captured Reachmen were brutally tortured and executed by the Nords, with the few that were spared being imprisoned in Cidnha Mine. The surviving Reachmen fled to the wilds of the Reach, creating what would become the Forsworn. Their leader, Madanach, was secretly imprisoned in the Cidhna Mine by Thonar Silver-Blood in an attempt to leverage control over the Forsworn. When the Thalmor discovered the presence of Talos worship, they demanded the arrest of the Nord militia. Igmund was forced to arrest Ulfric and his men or risk outright war over religious conflict. The Nord militia were eventually allowed to leave, but Igmund's broken promise left a fissure that would eventually widen into the Stormcloak Rebellion. The Forsworn still remember the cruelty of the Nords who deposed them, and seek vengeance against all Nords as a result. Driven from Markarth, the Forsworn spread across the Reach fortifying any defendable spot they could find. Large tented campsites are built into reinforced redoubts from the remains of various caves and ruins. Their members sport a unique tribal garb and adopt many of the traditions depicted in The Legend of Red Eagle. 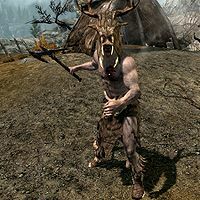 Forsworn gear is made up of a distinctive combination of fur, feathers, bone, and antlers that gives them a savage appearance. Their weapons also appear primitive, constructed of bone, wood, and stone in lieu of metal. The most archaic of their practices involves their reverence for hagravens, who are treated as matriarchs in their society. The hagravens offer leadership and access to a bizarre rite through which a Forsworn may become a spirit of vengeance, known as a Briarheart. The hagravens can remove a willing participant's heart and replace it with a Briar Heart that imbues vastly enhanced strength at the cost of their will and humanity. ...rise from death, Blood of our Blood." The Forsworn operate largely as a terrorist organization that attempts to strike fear into the hearts of their Nord occupiers. Each redoubt is as an individual cell operating under the orders of a Forsworn Briarheart or matriarch. The cells in turn may receive orders from Madanach, the imprisoned King in Rags. Forsworn raids are specifically aimed at non-Bretons living or passing through the Reach. They differentiate from common bandits in that they will often waylay an entire caravan or settlement leaving no survivors, but taking little loot. They've refused all attempts at making peace and will accept only the return of their land as a solution to the conflict. Forsworn come in a number of variants. The specific variety you will meet is level-dependent, though you will continue to meet low-level versions even at high levels. Boss-level Forsworn will always be at the highest possible level, and will be identified as "Forsworn Briarhearts." In addition, Forsworn may be spellcasters, archers, or one-handed melee fighters. The Forsworn name does not normally provide information on the fighting style of the Forsworn. There are twice as many male Forsworn as females, and—aside from some of the Forsworn Agents listed below—they are all Breton. Forsworn Warlords are defined in the game data as a variant that is even more powerful than the Forsworn Ravager. However, warlords do not appear in any of the leveled lists that generate generic Forsworn enemies and therefore do not appear in the game. ? With the exception of Briarhearts, all Forsworn wear Forsworn Armor and Forsworn Boots, and may be wearing Forsworn Gauntlets and a Forsworn Headdress as well (50% chance each). All of the following Forsworn fighters carry two one-handed Forsworn weapons (either two Forsworn swords, two Forsworn axes, or one of each). They also carry a random selection of other items, including gems, food, raw meat, recipes, potions, soul gems, and gold. There are three female varieties and five male varieties for each of the types listed below. ^1These Forsworn do not carry any of the miscellaneous items listed above. ^2This melee fighter also has the following perks: Extra Damage 2.5, Bone Breaker 2. All of the following Forsworn fighters wield a Forsworn Bow. They also carry a leveled dagger (iron, steel, or orcish) and a number of Forsworn Arrows, in addition to a random selection of gems, food, raw meat, recipes, potions, soul gems, and gold. There are three female varieties and four male varieties for each of the types listed below. 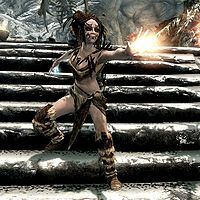 Forsworn Shamans are the primary spellcasters of the Forsworn, and appear at all levels (although they are only called Shaman at level 1; at higher levels they follow the same naming pattern as other Forsworn). They carry a leveled dagger (iron, steel, or orcish) and have a random selection of other items, including potions, soul gems, ingredients, and a leveled Destruction staff. All Shamans are female. Forsworn Briarhearts can be found wherever the Forsworn have set up camp. Briarhearts are named for the Briar Heart crudely embedded into their chest cavity and held in with leather straps. If the Briar Heart is stolen from them with the Pickpocketing skill, they will immediately die. Briarhearts can be deadly spellcasters and melee fighters, and appear at all levels. They are also frequently scripted to have unusually keen hearing, making it difficult to sneak up on them. Because of the ritual they have undergone to gain their power, Briarhearts are classed as undead NPCs and are vulnerable to undead-specific spells. However, they are detected with Detect Life rather than Detect Dead; this might be because the Briar Heart itself is living, but it might just be an oversight. There are two varieties of Forsworn Briarhearts that appear: one with the normal "Forsworn" class, and one with the "Forsworn Shaman" class. 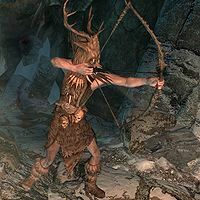 All Briarhearts wear a special variety of Forsworn Armor (which cannot be equipped by the player) in addition to Forsworn Boots and a Forsworn Headdress. All Forsworn Briarhearts are male. "Forsworn Shaman" class Briarhearts carry a leveled dagger and an assortment of potions, soul gems, ingredients, and a leveled Destruction staff. Note that the level 16 Briarhearts on the following table have the same amount of magicka as those of the same level in the table above; this seems to be due to the fact that these Briarhearts use the regular "Forsworn" class rather than the "Forsworn Shaman" class (most likely in error). Not all Forsworn traipse about in the wilderness dressed in tribal garb. A large number walk among the general population of Markarth and are indistinguishable from normal citizens. From there they are able to keep tabs on the goings-on in the city and strike terror directly into the heart of the Nord populace. While they are effectively imprisoned there, the Forsworn also control the Cidhna Mine. The mine is the heart of their leadership structure and a pivotal force in recruiting members to their cause. Borkul the Beast Cidhna Mine An Orc prisoner and Madanach's personal protector. Braig Cidhna Mine A prisoner that allied himself with the Forsworn. Donnel The Treasury House A Forsworn agent employed as a servant by the Silver-Blood family. Dryston The Warrens A Forsworn agent acting under Nepos. Duach Cidhna Mine An imprisoned Forsworn. Kaie Markarth Ruins A Forsworn that is instrumental in the plot to free Madanach. 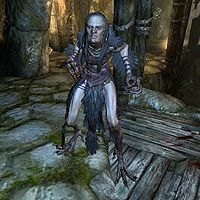 Madanach Cidhna Mine The imprisoned Forsworn leader known as the King in Rags. Morven Nepos's House A Forsworn agent that guards Nepos. Nana Ildene The Treasury House A Forsworn agent employed as a servant by the Silver-Blood family. Nepos the Nose Nepos's House A Forsworn steward serving directly under Madanach. Odvan Cidhna Mine A Breton prisoner that allied himself with the Forsworn. Tynan Nepos's House A Forsworn agent that guards Nepos. Uaile Nepos's House A Forsworn agent that guards Nepos. Uraccen Cidhna Mine An imprisoned Forsworn. His daughter is Uaile. Weylin The Warrens A Forsworn agent that attacks Margret when you first enter Markarth. Drascua Dead Crone Rock Matriarch of Hag's Rock and a Keeper of the Razor. Melka Blind Cliff Bastion Feuding with Petra. Will ally with you during The Affairs of Hagravens. Petra Blind Cliff Bastion Feuding with Melka whom she has imprisoned. Throughout all of the Reach, a majority of the marked areas are controlled by the Forsworn. Caves, forts, and Nordic ruins are easily fortified as redoubts. Within these makeshift forts, the Forsworn make sprawling camps that protect their matriarchs' nests. Bleakwind Bluff Nordic Tower An isolated tower that is home to a matriarch and a small band of Forsworn. Blind Cliff Cave Cave A large cave and fort system that is home to the feuding matriarchs Melka and Petra. Broken Tower Redoubt Military Fort A medium-sized fort built into a cliffside that is used as a prison. Bruca's Leap Redoubt Cave A small cave used as a ritual site for creating Briarhearts. Cidhna Mine Mine Markarth's prison and secret base of operations for the King in Rags. Cradle Stone Tower Nordic Tower The nest of the matriarchs for the Lost Valley forces. Dead Crone Rock Nordic Tower The nest of matriarch Drascua. Deepwood Redoubt Nordic Ruin A large redoubt built into a barrow used to protect the Deepwood Vale. Deepwood Vale Campsite A sprawling campsite serving under the matriarch at Hag's End. Dragon Bridge Overlook Campsite A small scouting camp overlooking the pivotal Dragon Bridge. Druadach Redoubt Campsite A cave and campsite set up as a village and base of operations for Forsworn leaders. Fort Sungard Military Fort A large strategic fort located near Whiterun and Falkreath Holds. Hag's End Nordic Ruin The nest of the matriarch for the Deepwood Vale forces. Hag Rock Redoubt Nordic Ruin A redoubt used to protect the matriarch Drascua at Dead Crone Rock. Karthspire Campsite An ancient area that hides the way to Sky Haven Temple. Karthspire Camp Campsite A fortress that sits across the Karth River. Kolskeggr Mine Mine A gold mine invaded by Forsworn forces. Lost Valley Redoubt Nordic Ruin A massive fort system that is home to several matriarchs. Rebel's Cairn Nordic Ruin The ancient burial tomb of the Forsworn folk hero Red Eagle. Red Eagle Ascent Cave A small pass that protects Red Eagle Redoubt from the south. Red Eagle Redoubt Campsite A sprawling camp and ritual site for the Red Eagle's Rite. Serpent's Bluff Redoubt Campsite A small camp west of Rorikstead. Sundered Towers Nordic Tower Ruined towers that protect Red Eagle Redoubt from the north. More information about Forsworn weapons and armor can be found at Specialty Gear. In addition to these generic items, there are also a few unique Forsworn items that can be found in Skyrim. *Item can be obtained through the console command player.additem 000ae087 1. Find Red Eagle's sword: Find Red Eagle's sword. "Come. Come and face the Forsworn..."
"First you... then all of the Reach!" "The Forsworn will reclaim what is rightfully ours!" "Kill one of us, and three more will take their place. The Forsworn are unstoppable." A group of Forsworn spawn near Dragontooth Crater. These Forsworn are not hostile and when they die they will say a greeting. For more information on Forsworn in the Elder Scrolls universe, see the lore article. Forsworn Note — An oath of readiness to a Forsworn Matriarch. Forsworn Note — An urging to hasten the taking of Fort Sungard. Red Eagle's Rite — A rite to raise the legendary Red Eagle from death. Thonar's Journal by Thonar Silver-Blood — Revelations that Thonar Silver-Blood is having secret dealings with the Forsworn. Weylin's Note by N — A mysterious letter signalling Weylin to kill Margret. This page was last modified on 16 March 2019, at 10:39.